According to Jared Diamond, the Spanish conquered the Aztecs and Incas with guns, germs, and steel. At first blush, his conclusion seems undeniable. But I’m actually not so sure about the steel. If steel gave the Spanish such an advantage in the 1500’s, why did so many conquistadors abandon their European breastplates in favor of Aztec and Inca cotton armor? 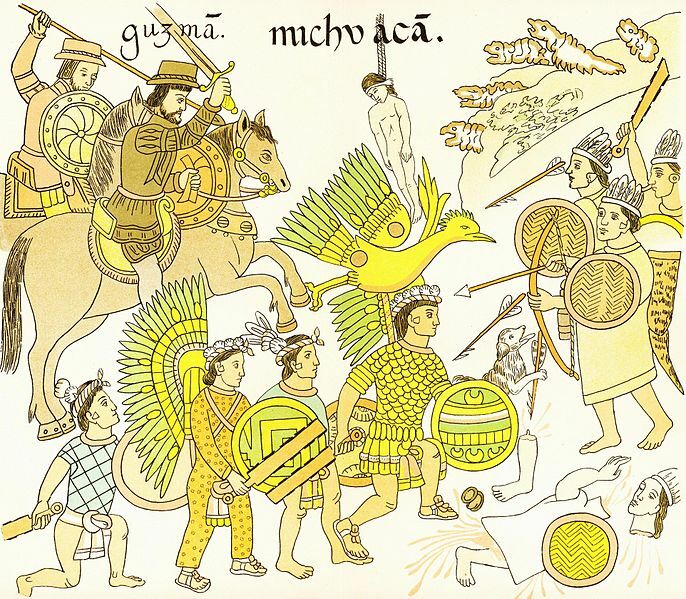 Native Mexicans vs. conquistadors (facsimile of a mid-1500’s illustration). By the time of the Americas’ conquest, European technology had focused for centuries on making things hard. The Europeans were masters of church bells, for instance, which gave them an edge over other Eurasians when it came to casting cannons. Europeans also built sturdy wooden ships, and they were masters at stone-craft, particularly at compressing stones into that central feature of so much European engineering: the arch. The Pre-Columbian civilizations, on the other hand — and particularly the Incas — had focused on the technology of tension. They created tight weaves of threads and reeds and other flexible strands. In other words, the natives were masters of fabric. The Incas built boats of reeds almost as long as Columbus’ ships. These were flexible, hardy vessels that carried twenty sailors and could travel hundreds of miles from shore. And instead of using stone arches or wood for bridges, the Incas used vegetable fiber cables and pioneered the suspension bridge. And of course, the Pre-Columbian civilizations made armor. Both the Aztecs and Incas sandwiched cotton between layers of cloth and leather and stitched the whole thing together, creating quilted vests and body suits. This cotton armor was very dense and could be two fingers thick. And it repelled arrows and spears almost as well as a Spanish steel breastplate. Plus, cotton armor was much lighter, cooler, and more flexible, which probably erased the breastplate’s advantage in toughness. That’s why so many conquistadors fought in native armor. I don’t actually mean that steel had no advantages. The Spanish offensive weapons — swords, lances, crossbows — killed more effectively than the natives’ wood and stone swords, spears, bows, and clubs (though the difference wasn’t as much as you might think). But steel’s advantage apparently wasn’t enough to overcome the appeal of Pre-Columbian fabric tech. What would the world look like if the Inca and Aztec civilizations had survived and continued to develop fabric technology? Would we have fewer traffic jams and parking nightmares, thanks to bendable, squeezable cars? Could we roll our laptops into scrolls for easier transport? Would we all live in earthquake-safe, tornado-resistant homes that simply jiggle with tremors and bend in the wind? Maybe, at the very least, our soldiers and police would wear lightweight, bullet-proof underwear. If you want to learn more about fabric armor — in the Old World, which actually wasn’t totally ignorant of fabric tech — check out these great blog-posts by Heather Pringle: (1) Cloth, a Body Armor of Choice? ; and (b) Replicating the Armor of Alexander the Great. 1491, New Revelations of the Americas before Columbus, by Charles Mann (2005). Note that many historians question a fundamental plank of Mann’s thesis: the enormity of the Pre-Columbian population. Aztec Warfare, Imperial Expansion and Political Control, by Ross Hassig (1995). The Incas, by Terrance D’Altroy (2003). © 2011, 2015, 2018 by David W. Tollen. All rights reserved. Question; Is that a maori warrior in the image at the top of your blog? Interested in the inspiration that caused you to choose him. David, good eye! That is a Maori warrior. As for the inspiration, a lot of it was legal, frankly. I wanted to give the developers paintings of historic figures in the public domain, and that Maori comes from the 1800’s, so the copyright has expired. I had gotten attached to the European queen on the right side of the header (Maria Theresa, the Holy Roman Empress of the mid-1700’s), and I wanted the other pint-holder to come from a culture far from Europe in terms of both geography and style. I originally looked for Mesoamerican candidates, but that Maori just leapt out at me. What evidence do you have that cotton armour was as effective as metal? 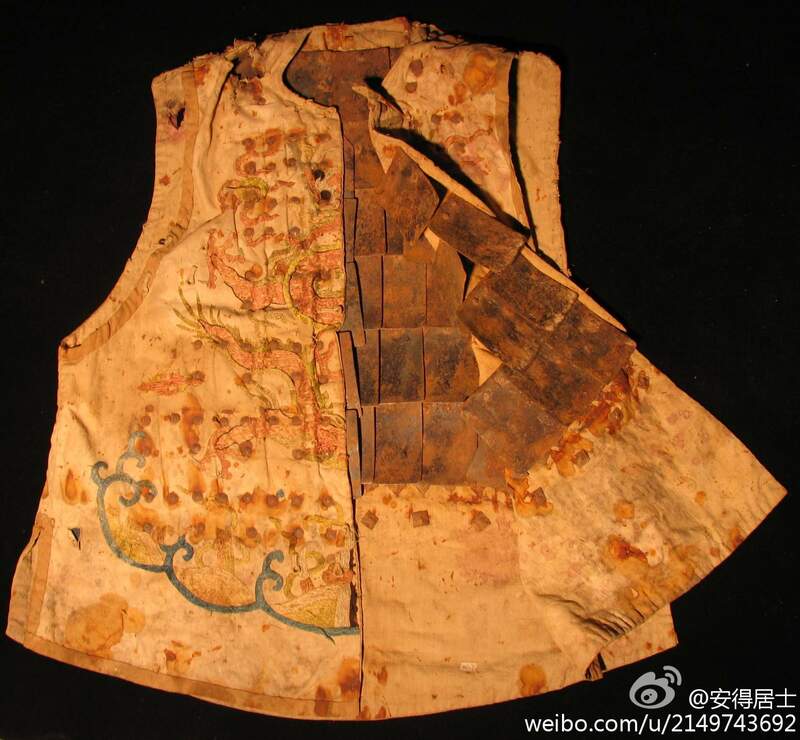 Quilted fabric armor was pretty common in most parts of the world, but quickly replaced with bone, leather, wood, metal and other materials where possible. I get your softness vs hardness angle, but Im not buying it that softness comes close to being as effective as hardness as a way of enabling technological progression. In addition, you use western ships as an example of “hardness”, when in fact they are designed to flex and twist rather than break, so in fact, a controlled amount of softness is being used. That is not entirely accurate. I recommend a video on youtube titled “The TRUTH about padded and leather armor (Gambeson / Aketon)” by Shadiversity. Speaking of Mesoamericans (which he doesn’t mention), their armor was often 3 fingers thick, more than enough to stop an arrow. If it could stop obsidian, which is ultra sharp, what makes you think it wont stop a considerably duller steel tip or blade. Note that with cloth armor, especially of that thickness, the physics are different. By absorbing the force of the blow, it lessens the hardness advantage of steel over stone/obsidian. The sharpness of the top or edge matters more in that situation (See above). In many cases (not all), especially in the conditions of the western hemisphere, cotton armor truly was superior. You are probably thinking that it resembled a pillow or tshirt. Far from it. Again, watch the video. I shared the title with you. Steel swords might not be as razor sharp as obsedian, but it is much more durable and more weight. You don’t have to cut through the padding to deal damage, the concussive force of a heavy object can cause as much harm underneath it. The is why blunt weapons like warhammers and maces were used against armored opponents. The objective wasn’t to penetrate the armor but to transfer concussive force that can cause internal bleeding and even broken bones. Even against obsedian steel armor is better bec. an Aztec obsedian club would shatter on impact – rendering your opponent without a weapon. Despite its sharpness, obsedian is incredibly brittle. The conquistadors had spears, swords, arquebuses, and crossbows. Both Mesoamerican and Andean armies had slingers and maces. I sure as hell wouldn’t want to be on the receiving end of a barrage of sling projectiles wearing either cotton or steel armor.. Just to clarify, I’m not sure what argument against pre-hispanic armor you’re making in this instance that I hadn’t already discussed. ii believe that in the conditions cotton or fabric armor would fare bettter than carrying a heavy breastplate through an amazonian jungle. The amazonian jungle is RAIN forest. Imagine wearing inch thick quilted cotton armor that is WET. Now tell me which would fare better? A breastplate made from 1/16 inch steel, or one made from inch thick wet cotton? The tensile strength of cotton increases when wet. it might be that cotton was better armor in the rainforest than metal breastplate. Because of the moisture and climate. And metal rusts. Europeans didn’t want “hardness” in their armour and weapons, they wanted effectiveness. An excellent sword has a perfect mix of hardness (sharpness) and flexibility (so it doesn’t break). Soft armor was not unknown to europeans – they had centuries of using scale, lamelar and padding. Metal armor was simply better. As for the claimed benefits of padded armor – inch thick quilt will never be cooler or more flexible than well fitted and articulated plate and chainmail. Weight for weight, it might be more effective against the obsidian studded clubs used by the aztecs, but I doubt it. The author uses western ships as an example of western obsession with “hardness”. In fact, the ships are designed to flex and bend in rough seas, using a controlled mix of hardness and softness. The same is true of modern bridges and skyscrapers. Western civilization hasn’t rejected softness, but has instead mastered mixing hardness and softness. The conquistadors actually didn’t fight the Aztecs or Incas in the Amazon — or in northern South America, except a small sliver of it. The Aztecs were in central Mexico and the Incas were on the west coast of South American, particularly high in the Andes. I don’t mean to say the conquistadors never fought in the jungle. They did. But Latin American offered them a lot of climate zones — and hot weather fighting was already familiar to the Spanish. So I don’t think heat and jungle alone explain their adoption of native cotton armor. The point isn’t that Europeans preferred hardness to flexibility. The point is that European technology was good at making things hard and not particularly good at making things flexible, and Pre-Columbian technology was the opposite (relatively speaking). Finally, yes, the Europeans had experience with fabric and leather armor. But their fabric and leather armor wasn’t as good as the Pre-Columbians’, due to lesser technology for making tough, flexible materials. Even a cursory review of 15th C literature on arms and armor shows that European military gear was based on highly evolved (quite literally by survival of the fittest) fabric and cordage, with steel only attached on the outside and then only for specific purposes. Lancers, for example, were heavily armored against other lancers; footmen were not. So, European military fabrics included linen, cotton, silk, fustian (linen warp with cotton weft), wool, and sinew–not to mention steel chain mail with each ring individually riveted, which is a very sophisticated fabric indeed. In addition, Europeans had a wider variety of leather hides (horse, cow, sheep, deer, goat, pig) for specific uses. What particular fabrics did the Mexica or other tribes (all different) produce that were measurably superior? As for Spanish troopers reverting to cloth armor, why discount the obvious explanation that it was cooler in the tropical heat, and easier to maintain in the field far from the forges of home? As for tension versus compression technology, it bears mentioning that the wooden hulls of the Spanish fleet were not the innovation that conquered half a planet. The intricate web of stays, guys, and sails supported by only the occasional compression mast and spar, were what enabled them to cross the ocean routinely. The greek linothorax wa also a cool piece of fabric tech. As noted above, Europeans *did* frequently use various kinds of quilted or flexible armor, though thick angled breastplates were generally preferred against firearms – in part because while a quilted armor might keep a projectile from killing you, it probably won’t keep it from crippling you. After taking a gunshot or spear to the ribs in quilted armor, even if it does not penetrate, you are quite likely to suffer broken ribs and/or severe internal bruising. Another note, which you’ll see a lot even in modern combat – hard shell armors tend to be very hot and uncomfortable, particularly in hot, humid environments. US soldiers have to be constantly reminded NOT to remove their highly advanced composite body armor when it gets hot out. The upper half of South American, one will note, includes a LOT of Jungle. Given just how many soldiers collapse/die of heatstroke in environments like that, I think it can be rather clear that their decisions regarding armor don’t always have to do with getting shot. Interesting points. Minor nitpick: The Aztec empire was situated in North America, not South America. But it was certainly hot where they lived and fought. In writing about the linothorax as mentioned in the Iliad for my senior seminar paper at UC Berkeley (of all places! ), I happened upon this article. Now I’m wondering how to work Mesoamerican cotton armor into said paper… 🙂 Thank you for the fascinating read! I think this article is a bit “politically correct” in trying to somehow show the natives had somewhat equal armaments and that luck and disease won the day. I disagree entirely. Eurasian civilizations had superior fabric weaving and using cloth-leather in armor goes back to the bronze age. It really doesn’t matter who discovered America, the Ottomans, Chinese, Indians, or Europeans, either would have mopped the floor with any native army. I just finished reading The Conquest of New Spain by Bernal Diaz. It’s a conquistador’s firsthand account of the seige of Tenochtitlan, and it gives a lot of details about the living conditions of the Spanish Soldiers. Something that is emphasized in the book that hasn’t been touched on here, is the necessity for conquistadors to sleep in their armor, so that they’d be ready to defend themselves against nighttime attacks at all times. If flexible cotton armor afforded a soldier a better night’s rest and helped to ward off fatigue, that is a huge advantage over sleeping encased in metal. Diaz also mentions that the conquistadors wore sandals, but he doesn’t say why or how that practice evolved. One form is similar as 13-14th european coat of plates. It was used from late Ming dynasty (1600) until Qing dynasty (1840) of China. Korean also copied this form. http://ww2.sinaimg.cn/large/80227c4ctw1e7hf0pnu28j219y16i7a9.jpg (armor plates riverted under the thick cotton gambeson). Later, Korean invented further modern bulletresist vest by using dense weaven wool fabric (13 layers – 30 layers, 2cm thick) in 1860, named Myeonje Baegab (면제배갑). Um, I know this is an old thread but many modern militaries do use fabric armor. It’s called Kevlar. As for Mesomerican armor, I found this page trying to find historical and archaeological accounts of salt use in Mayan armor. I guess I’ll move on. This is a very old thread, but some of us are still subscribed. Please say more about “salt use in Mayan armor”. That sounds fascinating. I have some thoughts to share. Please be patient with me. I’ve seen lots of very ignorant comments on here from cultural chauvinists who seemingly jump at any opportunity to spew their ignorance (see above for a couple of very obvious examples) about all matters regarding amerindian civilizations and technology. We are all so influenced by the ancient and outdated concept of the “stone age-bronze age-iron age” progression of human technology that it clouds our common sense and frames humanity in very limited ways. Just look at the historical accounts and you’ll see first hand what the Spanish conquistadors witnessed in person. A great book on general Mesoamerican technology is James O’Kon’s “The Lost Secrets of Maya Technology”. It’s stuff that was the basiscs of urban civilization in Mesoamerica like their huge furnaces for processing lime to make their concrete at almost industrial scales, deforesting much of the Mesoamerican landscape by the end of the first millennium CE, water treatment techniques, etc. It was not just plain, layered cloth armor. Many varieties were treated with brine and filled with rock salt as they did it in Yucatan and many types extended well past the knees as in Guatemala and upper Central America. Also keep in mind that warriors tend to avoid blocking blows from their opponents using their bare armor. They tend to prefer using shields and bucklers to accomplish that. Again, common sense. As for weapons, Aztec obsidian edged wooden swords-which had achieved a significant level of hardness and durability using now lost techniques as shown in Spanish chronicles-was said to have been able to decapitate a warhorse in one blow. Up in the southwest, sinew back bows could put enough force behind an arrow that it could penetrate Spanish armor. In the kingdom of Cofitachequi, De Soto tested the armor of the locals and found out that their specially crafted wicker shields could effectively stop a crossbow bolt. Southeastern bows were also able to penetrate one or two layers of chainmail (a demonstration for De Soto by an Indian captive). Thick, multilayered leather armors were also common throughout the continent. These were all adopted by the frontier militias of New Spain as well, just like the cloth escaupiles, from the Nahuatl ichcahuipilli. This goes without mentioning the slings and mace type weapons which would easily break bones or cause concussions. I dare anyone to take a blow from a stone or bronze mace head while wearing one of those superior steel helmets. I’d tell you to enjoy your visit to the ER but then again, I’m not at all advocating doing such a stupid thing. Fun fact: some Mesoamerican forces had pikemen as well, similar to what the Spanish would be more familiar with going into the 16th and 17th centuries. Effective against cavalry in the same way. A charging horse is not going to want to run into a long wall of long, sharp spears if it can absolutely help it. I tend to agree that the military technology, while interesting, is not the best that the civilizations and societies of the western hemisphere had to offer. Their most interesting stuff was agricultural and cultural. That’s how any sane individual would judge the value of a civilization: by it’s ability to create, not to destroy. And boy did Amerindians create. Such original stuff too. This is the best slow-motion discussion I’ve ever seen! Thank you for your thoughtful and detailed comment. As an armor geek, I’m a huge fan of experimental archaeology. We know they *could* do it because they *did*. So how did that work exactly? I’ve been to several Mayan sites, some Mexica (Aztec) and a pre-classical center, but these parks are deep on mythology and very thin on technology. I’m adding The Lost Secrets of Maya Technology to my reading list (even though, as one Amazon review noted, the title sounds like “another bizarre book on 2012, aliens or other esoteric strangeness”) . Returning to the original post, I still very much doubt the poetic but vague assertion that European flexible materials were inferior because of their rigid thinking. However, that doesn’t mean that the Mesoamericans were without some very sophisticated tech (both tension and compression) of their own. While it did ride the wave of the 2012 phenomenon in popular culture to a certain extent, the stuff about technology and engineering is great. My philosophy is to separate the good from the bad and only take the good. This, of course, entailing an ability to distinguish the bad. I will say that I tend to stay away from the less mainstream stuff about Mesoamerican religion and philosophy (including their calendrics) since it’s so easy for popular writers to infuse it with their take on New Age to profit from the pseudoscientific and New Age wave we’re currently seeing. That’s just my personal preference. Those accounts sound exaggerated. A sinew bow capable of penetrating steel armor? Given that the Mesoamericans had obsidean tipped arrows, that is very unlikely. Obsedian maybe very sharp, but it is incredibly brittle. Obsedian weapons are good against lightly armored or unarmored foes, but against steel armor, they would shatter on impact. Contrary to popular belief, not even English longbows with steel/iron bodkin arrows can penetrate good plate armor. So somehow obsedian arrows are said to penetrate spanish steel plate? They either used poor quality armor or the account was exaggerated. If the Aztecs fought on a European battlefield against a European army, they would have been decimated. The point you make regarding the steel helmet is also rather ridiculous. Taking a blow to the head from a mace with a steel helmet is a hell of a lot better than taking it without one. Your chances of survival is much better, which is what a helmet is supposed to do. I dare you take a hit to the head with a mace without a helmet. You would be luckly if they send you to the ER instead of the morgue. Helmets, just like armor, works. It is why even modern soldiers today still have them. I agree with Tortoise and many of those who’ve cast some doubt on the fighting power of Pre-Columbian armor. (And my post does not suggest that the two civilizations’ armor tech was equal.) I’m also a bit skeptical of often-repeated claims about the cutting and killing power of Pre-Columbian wood and stone swords. I doubt an Aztec sword really could behead a horse in one blow on any regular basis. I suspect you’d need a very carefully aimed blow, with lots of prep, by one of the strongest men ever. (Most of us couldn’t behead a horse at one blow even if we had a light-saber.) Also, one good clash with a steel sword and I suspect you’d see how quickly a wooden sword can break. However, I don’t think the comments about helmets disprove the argument about the strength of Pre-Columbian fabric-tech. Of course we don’t use fabric for helmets; they’re not meant to block cuts or stabs but rather to protect the head from crushing blows. Even modern kevlar can’t do that. So yes, the Pre-Columbians had nothing to rival European steel helmets. But that doesn’t mean their fabric wasn’t excellent at doing its job: blocking cuts to the body. And Pre-Columbian fabric armor apparently had a lot going for it. Given the choice between (a) significant weight and stifling heat in steel armor and (b) slightly less robust but lighter and cooler fabric armor, I can see how many warriors would choose the latter — particularly in the heat of Mexico or Central America. That’s apparently what many conquistadors did. I suspect, however, that they kept their Spanish helmets. Tortoise, you’re venturing into very strange theoreticals. A Mesoamerican army would have never ended up on some French battlefield facing a bunch of expensively armored knights (who were already the elite anyway so they could afford the armor). And the conquistadors-the relatively few who participated compared to the thousands of native levies- would have kept their helmets only since the Mesoamericans didn’t customarily use helmets themselves. This is really a case of showing disbelief at multiple claims made across space and time from the Alabama to Bolivia by old veterans who were actually there and saw it with their own eyes. Yeah, I have a good idea as to which side is more believable. Sort of like how 150 years ago, Anglo-Americans actually thought the Celts had built the thousands of ancient mounds that dotted the Eastern United States in spite of multiple Spanish and French chroniclers clearly showing who had done it and oral traditions from various tribes pointing to it. Seriously cultural chauvinism is behind the philosophy or idea that Spain destroyed the great Meso-American empires so quickly? Are u saying it had nothing to with how as someone stated earlier that Eurasia was simply just far ahead technologically? The age of discovery occurred when the great powers of the Ottomans, Chinese, (eventually the Mughals too in India), and Europe were roughly at parity in power and tech. Any of those civilizations would have destroyed native armies easily. How is it culturally chauvinistic to point that out? Also in reply to the comment “it is best to judge a civilization by the ability to create not destroy”, wouldn’t it be self evident that those civilizations that have greater power to create would have greater power to destroy? That is the unassuming fact of life @unemployedhistorymajor? Not at all. I am not saying Aztec cotton armor wasn’t good. But I disagree with the assesment that the Europeans didn’t have something similar. From the comments, there seems to be a big misconception about how armor works. Wearing steel armor and helmets on their own wasn’t enough. Kinda like how foodball helmets and gear today have a layer of foam padding in them to soften the force of an impact on the body. Same exact concept. You don’t wear steel armor and helmets by themselves. You needed to wear a padded layer underneath to make it comfortable to wear and to disperse the concussive force of a strike. Gambesons, arming dublets, and arming caps were worn, made of thick padding. So Europeans were no strangers to the concept of padded armor. The creation of steel armor just added another layer of protection to the padding. In fact, the vast majority of European soldiers in the medieval period wore only thick padded armor. Only the wealthy could afford plate armor. And I agree, given the rugged terrain and hot climate, cotton armor over steel made much more sense for the conquistadors. The Aztecs repeatedly soaked their cotton armor in brine, so that the fiber provided a structure which held layer upon layer of salt Crystal’s. However the Spanish and their allies with all their horses and armor, were soundly defeated by the chichimeca who used no armor, only the silent bow and arrow using reed shafts, said to curve along the skin of the cadaver. They accomplished this through thorough scattering of livestock, and theft of key weapons and spies as well as timing, and pinpoint accurate shooting.